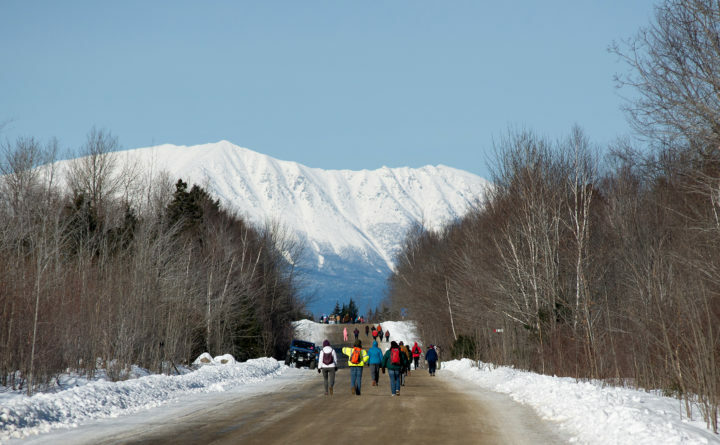 Participants in the 2018 Millinocket Marathon & Half head up the scenic Golden Road with Mt. Kathadin as the backdrop, Dec. 8, 2018. As we’ve seen in Millinocket over the past several years, economic recovery isn’t a sprint — it’s a marathon. Bouncing back from the loss of the former Great Northern Paper mill was always going to be a long road, and progress hasn’t happened overnight. But after tough times, and a recent setback in the mill site redevelopment, there’s still reason to believe that Millinocket can find its stride. Dec. 8 marked the fourth year of the Millinocket Marathon, a seemingly outlandish idea to somehow convince people to run 26.2 miles (or 13.1 for the half marathoners) in the early stages of Maine winter. That idea might not have been so crazy after all, however, and the race has blossomed from about 50 runners in 2015 to roughly 1,300 finishers this year. Organizers’ ability to draw more than a thousand runners to the Katahdin region — and to turn those participants into customers for local businesses — is a testament to the positive momentum for the race and for the region. There is no race fee for the runners, who are in turn asked to “generously support local businesses and contribute to the Katahdin Region in some way,” according to the marathon’s website. “We created some ripples in year one, and I think those ripples now have become surfable waves,” Allen added. It’s not just the marathon gaining traction. A group of Katahdin region natives and residents came together in 2014 to create Our Katahdin, a nonprofit that aims to rebuild the local economy after the mill closures. Last January, the group purchased the former Great Northern Paper site for $1 and is working to redevelop it. In September, the U.S. Department of Commerce announced a $5.3 million grant for Our Katahdin aiming to create more than 100 jobs and attract more than $200 million in investment. And while one arm of the federal government offers potential investment, another provides a major hurdle to the redevelopment efforts. The federal grant funding is contingent on Our Katahdin resolving an inherited tax issue with the Internal Revenue Service stemming from the mill’s previous ownership. On Dec. 18, Our Katahdin announced that the unresolved tax lien of more than $1 million, and subsequent delays in infrastructure redevelopment at the mill site, meant a previously-announced cross-laminated timber factory would not be moving ahead as planned. “This was a big blow for us,” Our Katahdin board president Sean DeWitt conceded at a Dec. 27 community forum following the announcement that North Carolina-based company LignaTerra Global is not moving forward with the $30 million factory. Our Katahdin believes the IRS is over-valuing the mill site and its organizational assets, and plans to appeal the agency’s denial of the group’s Offer of Compromise. Despite the obvious setback, and some naivete in underestimating what it would mean to work with the IRS, the mood and feedback in the room at last week’s community forum wasn’t all doom and gloom. Comments and questions from the audience focused more on constructive paths forward for the old mill site — and how the surrounding communities can be involved. DeWitt called the response “really inspiring for me.” He and many of the other board members are natives to the area with strong, generational ties to the old mill. Several board members no longer live in the area, but feel strongly about reigniting the Magic City and its neighbors. In the meantime, Our Katahdin is also looking at ways to pay off the tax lien without relief from the IRS — including bank loans, support from foundations and individuals, or potential mill site tenants who could bundle the loan into their operating costs. The community forum also allowed the group outlined some of its additional plans and efforts, including a three-town broadband initiative involving Millinocket, East Millinocket and Medway. Just like for the marathon runners last month, the finish line for Millinocket’s recovery might not always be in sight, but getting there is worth the effort.